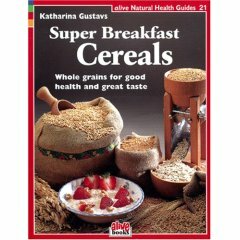 Super Breakfast Cereals-Whole grains for good health and great taste- By Katharina Gustavs, (60 Page) Paperback cover. Starting your day with a wholesome, nourishing breaskfast goes a long way in caring for your health and that of your family. Learn how to buy, store and prepare whole grains, and enjoy the simple recipes in the back of this book.